This is a reprint of an article that originally appeared in the Brattleboro Reformer on 8/27/2014. Mike Faher can be reached at mfaher@reformer.com or 802-254-2311, ext. 275. DUMMERSTON — West River Trail advocates are hoping to someday provide a relatively smooth ride for bicyclists along an old rail bed stretching from Brattleboro to Londonderry. But they’ve run into continuing friction in Dummerston, where there are questions about property titles, taxes, permitting and the impacts of a trail. Those tensions came up again at a recent meeting, leading a trail advocate to pledge cooperation with landowners. But for now, the project has stalled: Trail expansion requires a review of the group’s application by Dummerston Development Review Board, and officials say that cannot happen until several affected homeowners sign off. 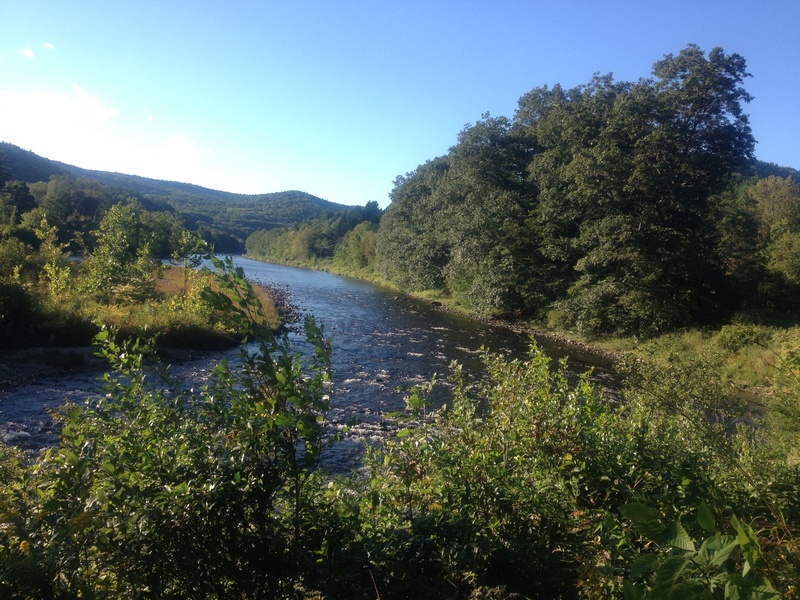 The popular hiking and biking path’s southern starting point is near the marina in Brattleboro. Following the former West River Railroad route, the trail extends north into Dummerston, where there is an access point on Rice Farm Road. “Our proposal is basically to start where the trail is ending now — where it comes out to Rice Farm Road — and to continue the trail along the original railroad bed up to the Nature Conservancy parking lot,” Cooper told residents and Dummerston officials. There also would be plans to create a safe crossing at a point where Rice Farm Road crossed the railroad, Cooper said. “Our biggest concern there is making sure there is adequate signage to protect both the people on the trail, so that they know they’re coming to an intersection, and for the people on the road so that they know they’re coming to a trail,” he said. But there are concerns among property owners including Sigrid Pickering, who said the trail would cross her driveway. She inquired about the possibility of fencing and buffers between trail users and her land. Without such measures, “that’s just an invitation to vandalism and theft, and that’s not really going to work for me,” Pickering said. She also draws a sharp distinction between the purposes of the old railroad right of way and the plan now being advanced by Friends of the West River Trail. “Putting a (trail) crossing sign up in the middle of this stretch of road without addressing the speeding traffic exacerbates an increasingly serious safety issue,” Pickering wrote. Cooper said the trail group could do nothing about the speed or frequency of traffic on a town road. But he maintains that developing the trail will improve safety in that area. But there are thornier issues for trail backers in Dummerston, including the question of who actually owns the railroad right of way. “If the trail goes through our property, are we supposed to pay taxes on this part of the property, or receive a tax break (since) part of our property would be for public use by a nonprofit entity?” asked landowners Jenna and Hakan Shearer Demir in a letter to the town. Trail advocates last year countered by saying the rail bed was not abandoned. Rather, they claim a clear line of transactions: The property was transferred from the rail company to the state, from the state to a quarry operator and then to a salvage company from which Cooper’s company acquired it before signing the parcel over to Friends of the West River Trail. That assertion, however, leads to the question of whether Friends of the West River Trail can or should be taxed by the town. Dummerston Selectboard member Joe Cook, while an avid cyclist and a trail supporter, made a “friendly suggestion” to Friends of the West River Trail. “I think it’s not in the best interest of the West River Trail (group) to own that property. You don’t want to be looking at a tax bill, I wouldn’t think,” Cook said. At this point, it’s unclear whether the trail group even can get their proposal before the town’s Development Review Board anytime soon. Annis said the trail project passes through a “special flood hazard area” and therefore requires both town and state approval. Annis pointed to the ongoing question of the property’s ownership, saying “our residents are paying the taxes on it.” If those owners do not sign the trail group’s application, “I’m not going to send it forward,” Annis said. But even if that happens, Annis pointed out, it does not mean the project is dead. This entry was posted in lower section, west river trail and tagged concerns, dummerston, lower section, questions, trail improvements stalled, vermont, west river trail. Bookmark the permalink.